Almost exactly five years after my first visit to New England I landed in Boston again. Logan airport hadn’t changed at all so I experienced a strange feeling of déjà vu. Fortunately it quickly ended when I got my rental car and drove straight towards the beautiful state of Maine. Why Maine? Well, it was one of the last two states among the lower 48 which I haven’t visited yet. More importantly, it is also the state with the lowest population density east of the Mississippi and one of the most heavily forested and wildest corners of the eastern United States ( it is called The Pine Tree State for a reason). Add a jagged coastline full of bays, rocky headlands and lighthouses, many wild rivers and lakes, small fishing towns and some of the oldest settlements in the US, and you have a recipe for a truly great holiday. But I started my tour of the state from the least wild southern part of it. 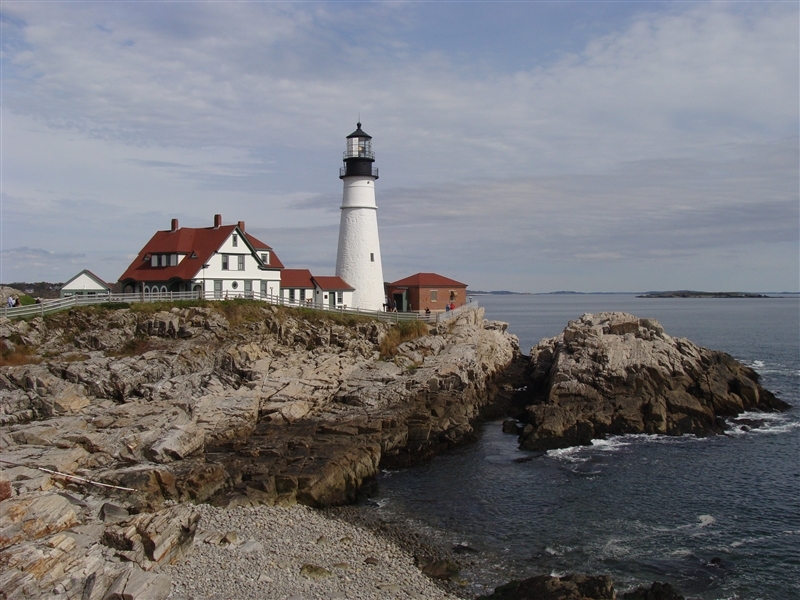 My first proper stops (not counting the cheap motel on the New Hampshire border) were the lighthouses around Portland. I was heading towards the Portland Head Light (according to guidebooks one of the most accessible and convenient to visit lighthouses) when, totally accidentally, I came across two lighthouses at Cape Elizabeth. At first I thought I was in the right place but then one of the locals told me that Portland Head was actually located a couple more miles along the road. In the end it didn’t really matter as all three photogenic lighthouses are scenically located along the short stretch of coast. Portland Head is apparently one of the most photographed lighthouses in the world while those at Cape Elizabeth are portrayed in several of Edward Hopper’s paintings. Portland itself is the largest metropolis in Maine. The word “metropolis” is actually a massive exaggeration in this case. Sure, its metropolitan area is home to a third of the state population but it is still less than a half a million souls, and only less than 70 thousand of them live in the city proper. There is a nice walkable downtown, offering some good shopping, eating and drinking options but, to be brutally honest, it will never be a major attraction of New England. 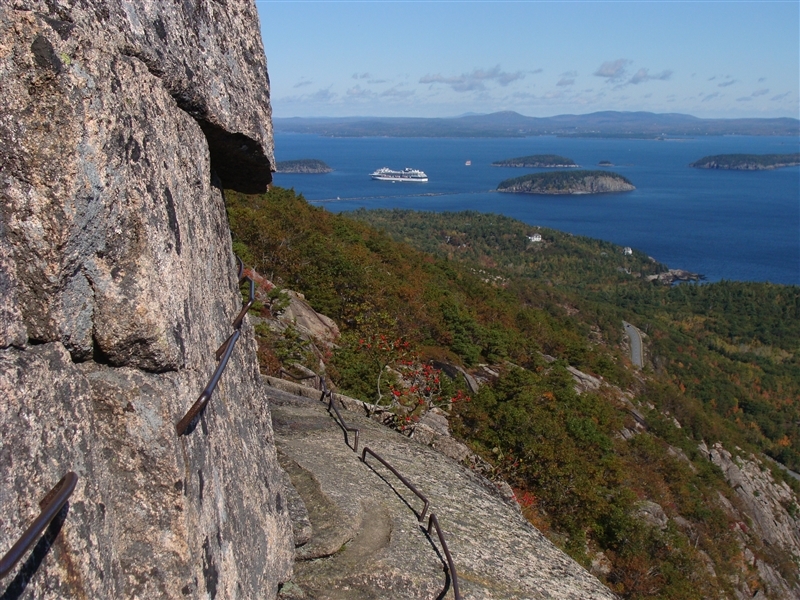 Acadia National Park, on the other hand, is one of the gems of this region. Located about 160 miles north of Portland, it is the only national park in New England. You can drive there in 3.5 hours or you can stop in countless gentrified, touristy towns and villages along the coast. In which case it might take you a week. I chose the fast straight route as I was eager to hit the trail. The first hike I chose is called the Precipice Trail and it is more of a climb than just a hike. There is even a warning notice at the beginning saying that it is a “non technical climbing route” not a hiking trail. Whatever you call it, it is a great fun. In fact, it is one of the best trails I have done in many years. It ascends only about 300 metres but it often does it via a near vertical route, especially near the top. As I said, it is great fun but not for the faint-hearted nor those who are scared of heights. In many places you will scale exposed rock faces, traverse narrow ledges (luckily with the help of metal bars in the most challenging spots) or climb metal steps fixed to the vertical cliff faces. It definitely shouldn’t be tackled in bad weather or taken lightly. People have died on this trail. What it does offer, apart from thrill and adrenaline rush, are absolutely amazing views along the way and from the top. For me it is out there, together with Angels Landing trail in Zion NP and Orla Perc trail in the Polish High Tatras, with my best outdoor experiences. After the climb I chilled out by simply catching some sun and getting lazy on the rocky coast of the Acadia, which is scenic, rough and beautiful. Acadia NP is very varied and has a lot to offer. Apart from the hikes there are also great cycling routes, running mostly along the car-free carriage roads which you can also tour by the horse carriage instead of the bicycle if you are feeling lazy. There are also lakes, woodlands and even a sandy beach. It is a really great national park, especially during the peak foliage season as during my visit. My time in Acadia was limited but I couldn’t leave before getting to the highest point in the park, the 470 metres tall Cadillac Mountain. Apparently, it is also the tallest spot on the whole Atlantic coast of the US. Fortunately for those who, like me, are short of time, and for lazy folks as well, you can drive right to the top of it. It might be sort of cheating but the amazing panorama from the top will kill your guilt in no time. Driving from the south to the park you will encounter many B&Bs, good restaurants, art galleries and other businesses clearly geared towards the rich folks from Boston or New York City. North of the Acadia the coast of Maine turns much wilder. Gone are the gentrified cute towns and villages as well as (more importantly) most of the cars. Especially the slow moving ones with the Massachusetts and New York plates. This is the coast of hard working fishing communities, down to earth locals driving pick-up trucks, gas stations selling hunting gear and lobster along the fuel and even some blue collar industrial towns like Bath with its shipyards building destroyers for the US Navy. And crucially, it is also the land of wide and empty roads running along the coast. Being a geographer I couldn’t resist the pull of West Quoddy Head which is the easternmost point in the US mainland as well as the closet place to Europe (and Africa) in the contiguous 50 states. There is a lighthouse (one of only two in the US painted, like in Canada, in red and white stripes to be better visible in snowy conditions), but apart from that there is not much else to see or do. It didn’t matter. I just like such extreme points where you are aware of your location on the map. Usually you can look towards the distant horizon and imagine far lands on the other side of the ocean. A bit disappointingly, from West Quaddy Head you can’t stare towards the horizon as, just off the coast, there is an island blocking any romantic vistas. But that’s Canada, so it didn’t spoil my experience too much. I was still standing on the easternmost bit of the Yankee soil. 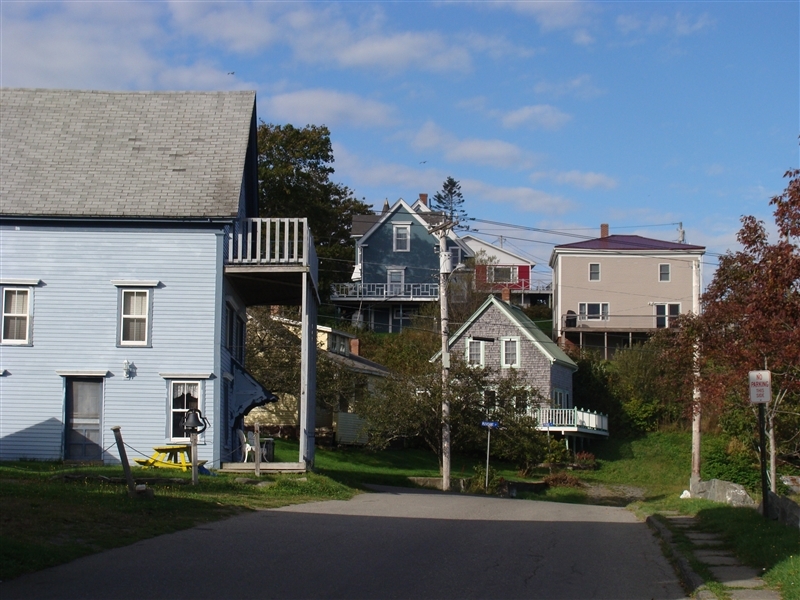 Accordingly I spent the night in the easternmost town of the US, small community of Lubec (incorporated in 1811). With a population of less than fourteen hundred it was a small place indeed but luckily it still had a decent motel. It was one of the small privately run establishments which you can find all across America in places too small, or too out of the way, for the big corporate chain hotels. I could skip mentioning it altogether if not for the absolutely fantastic home baked blueberry muffins offered by the owner for breakfast. Obviously there was only one way from Lubec, west. This time I skipped the coast and headed inland towards the capital of Maine, Augusta. If the coastal road was already quiet it was still nothing comparing to the emptiness of the inland Maine. It was almost four hours of relaxing driving. Especially as the two lane highways cutting through the endless forests were practically deserted. But even the interstate highway from Bangor to Augusta was one of the emptiest motorways I have ever driven. Augusta is a small place but after wandering in the under-populated east of the state for a while it felt much bigger than it actually is. However, the Maine State House was a let-down. It was one of the least impressive state capitols I have seen so far. And believe me, I have visited a fair share of them. But still, I couldn’t resist even just a brief visit inside. From Augusta I headed towards the next state, New Hampshire, where I got in no time via some small local roads for which my map reading skills were really helpful as New England doesn’t really follow a grid system like other parts of the US do. No, I still don’t use sat-navs. They dumb the journey down and I’m also too stingy to pay for their rental. Besides, map reading is fun (even if you have to do it on a steering wheel) and I wouldn’t change it to listening some annoying voice leading you like a child instead, no way. I might have visited Maine just because it was on my list of not yet visited states but I’m glad I did. It as it is a truly fascinating place and I can recommend it to anyone who likes travelling on the slightly more wild and unusual side. This entry was posted in Uncategorized and tagged Acadia National Park, Augusta, Cadillac Mountain, Cape Elizabeth, Lubec, Maine, Portland, portland head light, Portland Head Lighthouse, Precipice Trail, The Pine Tree State, West Quoddy, West Quoddy Head on January 21, 2013 by admin.